Liverpool cruised to a comfortable victory over West Ham at Anfield to keep their faint Champions League hopes alive and leave the Hammers with three games to secure their top-flight survival. Former West Ham midfielder Yossi Benayoun and David Ngog gave the hosts a 2-0 lead in a low-key first half and goalkeeper Robert Green's unfortunate own goal finished off his side. However, both teams still have a great deal to do to achieve their aims as Liverpool are still five points adrift of fourth place while West Ham are only three above the drop zone. A 10th successive home league victory was rarely in doubt against a club whose last win at Anfield came in September 1963 and who have much more important battles to win in the last few weeks of the season. Having dropped to seventh after the weekend's games, Liverpool's hopes of Champions League football appeared to be over. And with Fernando Torres' knee operation ruling him out for the remainder of the season, the suggestion was their chances of rolling over opponents had gone with him. If his stand-in Ngog's first attempt on goal was anything to go by that seemed a fair assessment. The 21-year-old Frenchman, often criticised for his decision-making, attempted to beat Green with a header from the edge of the penalty area from Jamie Carragher's long pass when he had time to bring the ball under control after springing the offside trap. 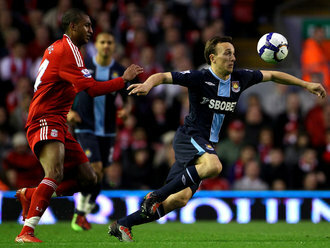 Having barely threatened, Liverpool took the lead in the 19th minute with a piece of quick thinking by Benayoun. Steven Gerrard's right-wing free-kick bounced in front of the Israeli seven yards out and he allowed it to deflect off his stomach and in off Green's right-hand post. From some angles it looked like it could also have brushed his arm but there were very few protests from the visitors. West Ham's response was brief, with Carlton Cole firing in a shot which Jose Reina did well to hold. Despite their lead the atmosphere inside Anfield seemed to reflect the team's forlorn hopes of fourth place and it was not improved when unmarked centre-back Sotirios Kyrgiakos headed Gerrard's 27th-minute corner down and over the crossbar from six yards. But a surprisingly smart finish from the raw Ngog eased those worries two minutes later when he converted Maxi Rodriguez's cross with a first-time shot after Benayoun had begun the move by cutting in from the left. Ngog was not nearly as clinical with his next chance, ballooning a header up in the air after Dirk Kuyt had nodded back Glen Johnson's hanging cross to the far post. Kuyt's 30-yard half-volley was much better, forcing Green to tip the ball around his left-hand post as Liverpool ended the half in complete control. West Ham replaced Junior Stanislas with Guillermo Franco for the second half but in truth everyone except Cole could have been substituted without complaint. Kuyt's quick break and cross from the byline almost picked out Ngog at the near post as the hosts continued to dominate. Having experienced mostly bad luck in a season which saw early exits from the Champions League and Premier League title race and numerous injuries to key players, Liverpool enjoyed another kindly bounce of the ball. If Benayoun's goal was fortuitous the third was even more lucky as Kyrgiakos' shot from Gerrard's 59th-minute free-kick crashed back off the post, hit Green and bounced back into the net. Gerrard was denied a fourth only by the slightest deflection off centre-back Manuel da Costa. West Ham's frustrations continued to grow but referee Peter Walton showed leniency to Robert Kovac by only booking the midfielder when he grabbed the official's shoulder and gave him a push. Even with the game over the hosts still pushed forward and Rodriguez's whipped near-post shot had Green scrambling to keep the ball from crossing the line at the second attempt while Kuyt's ambitious overhead kick showed confidence was certainly not lacking. Unfortunately for both Liverpool and West Ham, they will need much more than that if their seasons are not to end in disappointment and heartbreak respectively. Liverpool Reina, Johnson, Carragher, Kyrgiakos, Agger, Maxi,Gerrard (Mascherano 71), Lucas, Benayoun (Degen 77), Kuyt,Ngog (Babel 81). Subs Not Used: Cavalieri, Aquilani, El Zhar, Ayala. Goals: Benayoun 19, Ngog 29, Green 59 og. West Ham Green, Faubert, da Costa, Upson,Spector (Daprela 80), Behrami, Kovac, Noble,Stanislas (Franco 46), Cole (McCarthy 72), Ilan. Subs Not Used: Kurucz, Gabbidon, Mido, Diamanti.